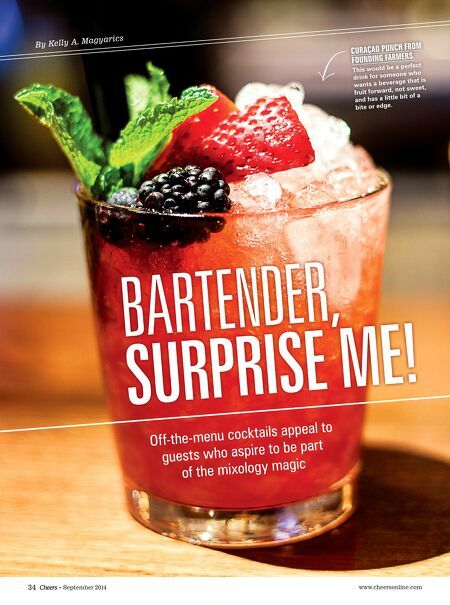 www.cheersonline.com 35 Cheers September 2014 • W hether you call them "Bartender's Choice," "Dealer's Choice" or "Tender's Whim," personalized cocktails offer an intriguing gamble to customers, and a willing challenge for bartenders. For operators who can make the concept work, custom-created concoctions draw the guest into the bartending experience, and give the venue a chance to fl ex its mixology muscles. The menu at Eleven Madison Park, an 80-seat contemporary American restaurant in New York's Flatiron District, includes a line that says "Bartender's Choice: Allow us to tailor a cocktail to your tastes." Unless guests choose to continue the conversation, head bartender Jim Betz and staff focus on three straightforward questions to glean the perfect sip: spirit preference, shaken and refreshing or stirred and boozy, and aversions or allergies. "Guests love the experience, and feel more ownership to the cocktails," notes Betz. The Bartender's Choice concept especially appeals to Eleven Madison Park regulars. "I know their preferences and just start making a drink when I see them come through the door," he says. "Or if they change it up, I'll wait to see what they are feeling today." The personalized cocktails cost $16, but if a specifi c spirit is requested, there is a $3 surcharge. Custom cocktails are Eleven Madison Park's most- popular drinks options, comprising 40% of all cocktail sales. WHAT'S YOUR FANCY? Most bars start the process by engaging guests in a conversation about cocktail preferences and aversions. Park Restaurant and Bar, a 160-seat modern neighborhood eatery and nightspot in Cambridge, MA, offers an $11 "Tender's Whim" option. The menu description for the "Tender's Whim" drinks states "Feeling Adventurous? Feel free to tell us about yourself." Bartenders will inquire about a guest's predilection for spirit category, type of sip (refreshing or boozy) and ingredient aversions. Park bar manager Chris Balchum has also discovered that preferred glassware can quite be telling. 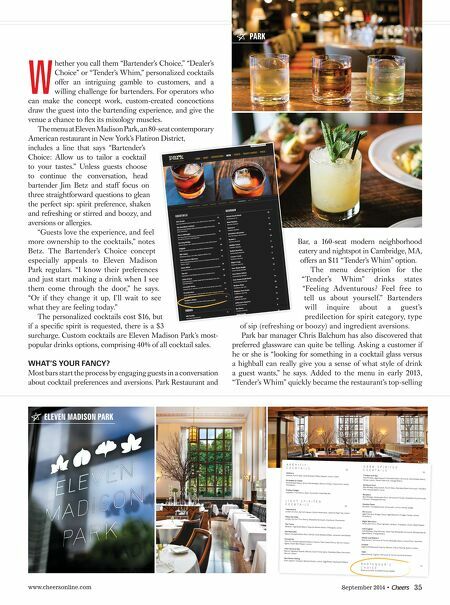 Asking a customer if he or she is "looking for something in a cocktail glass versus a highball can really give you a sense of what style of drink a guest wants," he says. Added to the menu in early 2013, "Tender's Whim" quickly became the restaurant's top-selling ELEVEN MADISON PARK PARK American restaurant in New York's Flatiron District, Park regulars. "I know their preferences and just start making a drink when I see them come through the door," he says. "Or if they change it up, I'll wait to see The personalized cocktails cost $16, but if a specifi c spirit is requested, there is a $3 of sip (refreshing or boozy) and ingredient aversions.